POLICE COMMISSIONER RASHMI SHUKLA, JT CP RAVINDRA KADAM, ADD CP RAVINDRA SENGAONKAR AND PRADEEP DESHPANDE. 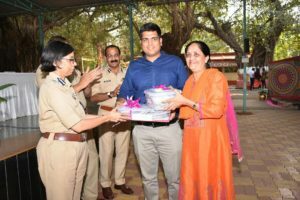 POLICE COMMISSIONER RASHMI SHUKLA WHILE RETURNING THE STOLEN ORNAMENTS TO THE FAMILY. 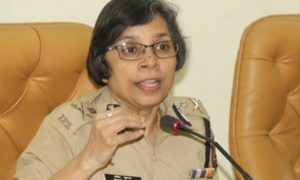 Pune 12 Jan 2018 (PCP NEWS) : Pune Police recorded 2168 crore rupees property which is attached in the previous financial year 2017, as registered in various offences, besides this today we have returned more than 1 crore rupees ornaments to 73 complainants, said Police Commissioner Rashmi Shukla this evening. Shukla, today presented the whole Data for the year 2017 in this annual press meet, she further added that looking to the graph for 2016, our teams have worked very nice, we have succeeded to detect major offences and in this year many criminals and gangsters were booked under MCOCA, MPDA and many were externed, which resulted free and fair Law and Order to citizens. 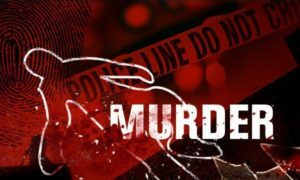 We had recovered around 111 Country make pistols with 269 Live Cartridges from 121 accused who are behind bars, said Shukla. 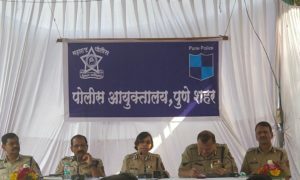 While speaking about Traffic in Pune city Shukla said that, With the help of CC TV, Traffic Unit had prosecuted more than four lakh fifty thousand and collected more than 1 crore rupees fine and with the help of E Challan and 425 Device Machines around 11 lakh eighty five thousand citizens were booked, who paid fine around 19 crore fifty thousand rupees fine, which is the highest ever collection and which had pressurized the citizens to follow the Traffic rules.